New Delhi : The crucial test of a true democracy is how it protects and respects the rights of minorities — both religious and political, Vice President Hamid Ansari today said. Addressing students and faculty of Poland’s prestigious University of Warsaw, Ansari described democracy as “self- correcting” and “self-improving” mechanism and said the solution to addressing the gaps and failings of democracy is indeed “more democracy”. “It is when democracy stops working, when conflicts are not peacefully resolved that violent separatist movements and religious conflicts emerge,” he said, pointing out that when the system is not inclusive and pluralism is suffocated, people look for other alternatives for advancing their interests. “A majority, no matter how overwhelming, does not invalidate opposition. The one crucial test of a true democracy is how it protects and respects the rights of minorities, be they religious, or political, especially in face of populist currents,” he said. Ansari emphasised that a democracy only flourishes when divergent voices can be freely heard without fear of an official or populist backlash. “In India, many discontents are manageable precisely because there is a democratic framework. For the last 70 years we have worked democracy to the best of our capacity, not yet to the best of our ability. It is a receding horizon,” he said. Underlining that “operating a democracy is always work in progress”, he said despite the success of democracy in India there still remain a number of challenges. “Democracy is a self-correcting and self-improving mechanism. The solution to addressing the gaps and failings of democracy is indeed more democracy,” the Vice President said. The Vice President stressed that democracy, in the end, is about people. “The people of India, the masses, are the best guarantee for our democratic future,” he said. He said containment of social discord remains a recurring challenge. Ansari said that democracy in India has taken equality and social inclusion as one of its objectives. 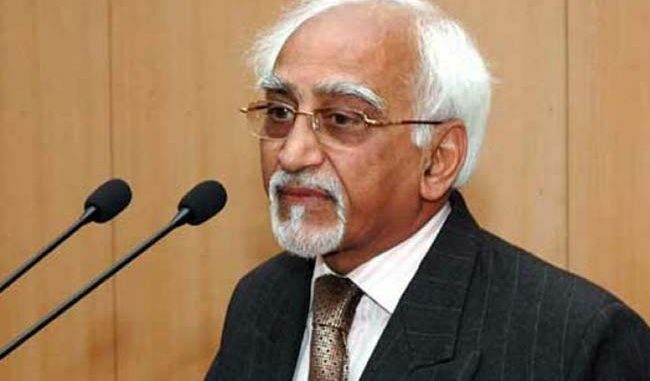 To those who know India well, Ansari said, “it was hard to imagine that if India s multicultural diversity was to be organised as an enduring single state, it could be organised as anything else but a democratic polity. “In a contemporary sense, the democratic consciousness of independent India is a reflection of the legacy of our struggle for independence from colonial rule,” he said. “Our people have used this legacy as the yardstick to judge the subsequent performance of governments, political parties and institutions,” the Vice President said. He said that an Indian, with some awareness of the recent and not-so-recent past, comes to Warsaw with a deep sense of the vicissitudes of history. Having the misfortune of being located at geographic crossroads, Poland s frontiers have waxed and waned over centuries, buffeted by the forces of regional history, he said. “The subsequent Polish struggles for freedom, and restoration of democracy, is therefore admirable and a visitor from the world s largest democracy cannot but salute the indomitable Polish spirit reflected in a Republic that has dedicated itself for the common good of all its citizens and is desirous of guaranteeing their rights for all times,” Ansari said.